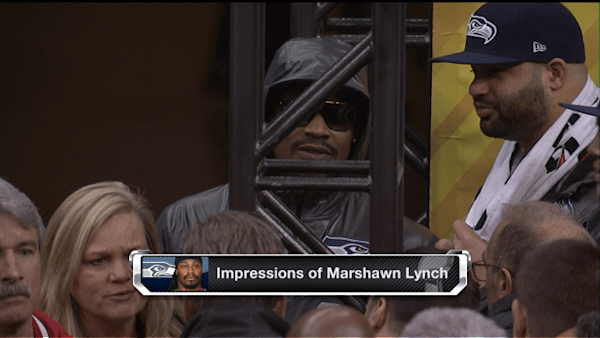 Did Seattle Seahawks running back Marshawn Lynch handle Media Day correctly? PLUS: NFL gets GREAT publicity, fans get LOTS of fun. What’s not to like? I often try for a zinger myself, but here I desist. It’s the best thing out of Brit-humor television yet. (and probably of any TV anwhere). Trust me. What’s a meta baby? Nothin’, baby, what’s . . .
Back in the Game: Former Trib editor and CNC board member Ann Marie Lipinski returns to journalism as director of Harvard’s Nieman Foundation. Eh??? Back in a sense, yes. But in meta-journalism, which is to journalism what metaphysics is to physics, right? I know people who have followed this advice and have not lived to regret it. Heard at breakfast table, 8 a.m.: “It’s getting late,” as speaker rises to get dressed for church. Springpad gives you a place to quickly and easily save anything you want to remember. Take a note, create a task, scan a product barcode and look up the book your friend mentioned. The best part is that no matter where you are, Springpad is there with you to make sure you don’t forget something worth remembering. Big tip of hat to Refdesk, specifically its Site of the Day, where many good things pop up regularly. That said, I must admit that consigning a great thought to such a saving bin is often to forget about it, in my experience. But how about notes for something you are working on? Instant retrieval here, which following instant saving — by e-mail, for instance — makes for a great aid to putting something together. Can you make money in yo-yos? There is an old joke applicable to the Catholic media apostolate: How does one make a small fortune in the Catholic press? Start with a big fortune. So what if it’s been said of the airline business, commodities, woodworking, something in Israel, or yo-yos, to name just a few possibilities. So what because if you haven’t heard it, you laugh or at least smile and (b) if you have heard it and the timing is right, you at least smile.